One of the most famous photos of the bodies as they were found agaist the north wall of the North Clark Street warehouse. There are six bodies. A seventh victim, who survived for three hours, had already been taken to the hospital. No single incident in the infamous Chicago Beer Wars of the 1920s better sums up the violence of that era than the St. Valentine’s Day massacre. The shooting, which left seven dead and a city in shock, is believed to have been the result of an ongoing battle for power between two major gangs - The South Side Italian gang led by Al Capone and the North Side Irish gang led by George "Bugs" Moran. Although the city was hardened to violence and newspapers ran photos of gang shootings almost daily, the massacre stunned the city because of its cold-bloodedness. Seven unarmed men, four associated with the Moran gang and two innocent civilians, were lined up facing a brick wall and machine gunned in the back. Although there are many theories about the reason for the shooting and who was behind it, it’s generally believed it was organized by Capone as part of a power struggle. The plan was to kill Moran and his top men. In the resulting chaos, Capone would accomplish two objectives. He’d eliminate his major competition and he could seize control of the vast and lucrative North Side. Unfortunately for Capone, the trap was sprung before Moran arrived at the warehouse. The victims were Peter Gusenberg, a top enforcer for the Moran gang; his brother, Frank Gusenberg, also an enforcer for Moran (amazingly, Frank was still alive when police arrived and despite having 14 bullets in him, he lived another three hours. When questioned by police at the hospital about the shooting, he said, "Nobody shot me. "); Albert Kachellek (alias James Clark), Moran’s former second-in-command who was retired but still maintained gang ties; Adam Heyer, Moran’s bookkeeper and business manager; Reinhart Schwimmer, a former optician who had abandoned his practice to become a full-time gambler. 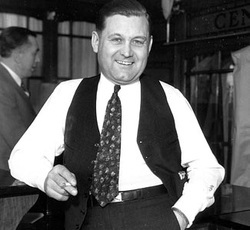 (He liked hanging around gang members and was basically a "gang groupie"); Albert Weinshank, who managed several cleaning and dyeing operations for Moran. (His resemblance to Moran, including the clothes he was wearing, is what allegedly set the massacre in motion before Moran actually arrived); John May, an occasional car mechanic for the Moran gang, though not a gang member himself. May had two earlier arrests (no convictions) but was attempting to work legally. However, his desperate need of cash, with a wife and seven children, caused him to accept jobs as a mechanic for Moran. Exterior of the warehouse. At least two of the killers entered this door. The office is to the left of the door. The victims were lined up against the north wall. There is a rear entrance that the two dressed as police officers entered. The plan was simple and basic. Lure Moran and his men to the S-M-C Cartage Co. warehouse at 2122 North Clark St., in the Lincoln Park neighborhood on Chicago’s North Side and kill them. The exact reason the gang was at the warehouse will never be known, but it’s believed the gang was lured to the garage with the promise of a cut-rate shipment of bootleg whiskey, supplied by Detroit's brutal and infamous Purple Gang (one of Capone’s main suppliers). Once the Moran gang was in the warehouse, the plan called for a four-man team of shooters, two dressed as police officers, to enter the building and kill Moran and the others. Capone stationed lookouts in an apartment across the street from the warehouse. 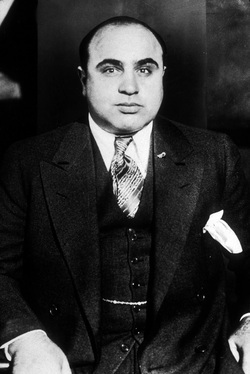 Wanting to make sure there would be no connection to his gang, Capone allegedly hired two outsiders as the lookouts ... and that would eventually cause Capone’s plan to fail. By 10:30 that morning, it was 18 degrees and a cold wind was coming in off the lake, Moran’s men had arrived and entered the warehouse. Moran, however, was not with them. One account states that he was supposedly approaching the warehouse, spotted the police car, and simply walked into a nearby coffee shop to wait for the police to leave. Another account was that Moran was simply late getting there and arrived after the real police. The lookouts, however, might have confused Weinshank for Moran because he was the same height, build, physically resembled Moran and even dressed like him. When the lookouts saw him, they signaled the gunmen to enter the warehouse. Witnesses outside would later told police they saw a Cadillac sedan - a common detective car - pull to a stop in front of the garage. Four men, two dressed in police uniforms, emerged and approach the warehouse. The two dressed as police were carrying shotguns and entered the rear portion of the garage. Inside they found who they believed to be Moran and four of his top people. Also in the garage were Schwimmer and May, who had been inside prior to the arrival of the gang members. The two "police officers," probably acting as if it was a raid, disarmed Moran’s men and lined them up facing the north wall of the garage. They then signaled to the pair in civilian clothes who entered and produced machine guns from under their long winter coats. One had a 20-round magazine and the other a 50-round drum. All seven men against the wall were killed in a volley of 70 machine-gun bullets and two shotgun blasts, probably from the "police officers," according to the coroner's report. To show bystanders that everything was under control, the men in street clothes came out with their hands up, prodded by the two uniformed officers with shotguns. The only survivors in the warehouse were John May's German shepherd, "Highball," and Frank Gusenberg, who would die at the hospital three hours later. When the real police arrived a short time later - called by neighbors who had gone inside the warehouse to investigate and found the bodies - they heard the dog howling as they entered the warehouse. Inside, they found the air still thick with the smell of gunsmoke - and the floor covered with blood, shell casings and corpses. The only sound was the dog’s eerie howling from under a beer truck. A police officer takes control of "Highball" after the shooting. At right is an artist's conception of the shooting.